Zach Hayes is an RTC editor, contributor and bracketologist. As the pre-Midnight Madness polls trickled out last Friday, it became glaringly obvious to us that consensus was more the exception than the rule. Aside from Duke at the top, teams like Butler and Kentucky somewhere in the middle and a precipitous decline for Purdue following Robbie Hummel re-tearing his ACL, agreement was about as prevalent as a British parliament session. Examining polls from a handful of websites that compiled a top 25 to prepare for the start of practice — ESPN’s Andy Katz, TSN’s Mike DeCourcy, CBS’ Gary Parrish, Fox’s Jeff Goodman and yours truly here at RTC — we found five teams with a noticeable amount of dissent attached to their name in the preseason. Let’s examine those schools and break down what they need to do to match optimistic projections and how they can avoid sinking to the depths of other predictions. Overrated at #7 if: the Orange are unable to replace the leadership, chemistry and production provided by fifth year seniors Andy Rautins, Arinze Onuaku and fourth year junior Wes Johnson. At times last season, Syracuse was a well-oiled machine on both ends of the floor. Players embraced their roles offensively and Jim Boeheim had the perfect roster at his disposal to stymie opponents with his patented 2-3 zone. The jury’s still out on whether Kris Joseph will be able to step into Johnson’s shoes and replace that versatility on the wing. Scoop Jardine was that sparkplug off the bench last season — will he be able to channel that effort for 35 minutes per night rather than 21.3 MPG? As many accolades as Fab Melo and Dion Waiters achieved in the high school ranks, depending on freshmen can be risky business. Asking them to drop just three spots in the polls after losing that considerable amount of production seems unreasonable and unrealistic. Underrated at #20 if: Remember last summer when Boeheim hyped up that transfer from Iowa State named Wes Johnson? He’s been doing the same with Fab Melo, telling SI.com’s Seth Davis that his seven-foot freshman will be “a strong contender for national rookie of the year.” Plus, let’s face it: storied, winning programs like Syracuse prefer to reload than rebuild. Last October, we were wondering how the Orange would replace Jonny Flynn, Eric Devendorf and Paul Harris (in hindsight, that looks foolish, but it was true at the time). Why should we believe any differently this time around? NBA scouts have tabbed Joseph as a future lottery pick, Jardine and Brandon Triche shot well enough in 2009-10 to believe they can pick up Rautins’ slack, and Melo is an immediate upgrade offensively over Onuaku. In a conference that lost personnel across the board, Boeheim has a shot to put together back-to-back Big East title squads. Overrated at #8 if: Missouri’s returning talent isn’t that good in the first place. The Tigers return their top three scorers from a season ago, but it’s not as though Missouri lit the world on fire in 2009-10: they lost games to Oral Roberts, Oklahoma and Nebraska before garnering a #10 seed in the NCAA Tournament. There’s also concern about the Tigers frontcourt — Laurence Bowers, Ricardo Ratcliffe, Justin Safford and Steve Moore –– regarding their ability to contain the behemoths that face them in the Big 12. Any team that takes care of the basketball, keeps the action in the halfcourt and boasts legitimate scoring big men can negate Mike Anderson’s chaotic full-court press and take the Tigers out of their comfort zone. The prized recruit of Anderson’s class, 6’8 power forward Tony Mitchell out of Texas, is dealing with eligibility concerns and hopes to join Missouri in time for the bulk of Big 12 play, but that proposition is in serious jeopardy. Underrated at #16 if: people underestimate the ability of Anderson to get the most out of his team. 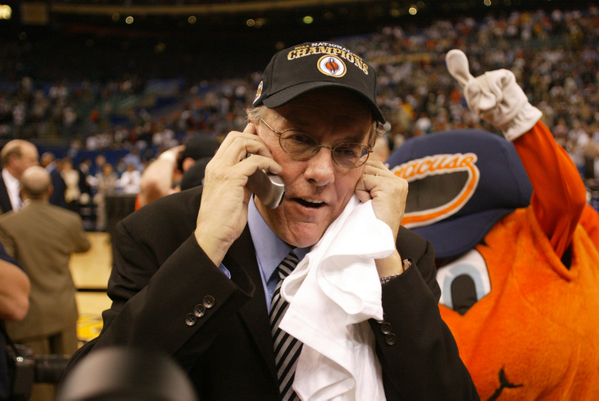 He’s positively giddy about the prospects of this year’s roster. There’s scoring punch on the outside with Kim English and Marcus Denmon, a dynamic point guard duo with Mike Dixon and Paul Pressey and plenty of candidates to thrust themselves into stardom in the frontcourt, especially Ratcliffe, the ultra-talent top junior college recruit. The Tigers full-court press keeps them in any game against any opponent if they’re able to force turnovers and impose their will. Anderson has the speed, versatility and athleticism to pressure opponents into oblivion. English is a phenomenal scorer and potential all-conference performer. If he develops more of a well-rounded game and improves efficiency, Anderson also boasts a go-to scorer when the Tigers need a clutch bucket. According to the website of Waco television station KWTX, there was an altercation on September 27th at Dunn’s campus apartment in which he allegedly struck his girlfriend with a closed fist, breaking both sides of her jaw which required emergency surgery and fixation devices to repair. The article also states, however, that the girlfriend — with whom Dunn has a three-year old child — is not interested in pursuing charges against Dunn, and that she will likely sign a document of non-prosecution. Yahoo’s Jason King is also reporting that an attorney representing the girl states that she is not planning to testify against Dunn and that she feels the “injury is consistent with a misdemeanor, and not a felony.” Aggravated assault is a second-degree felony in Texas which, in the event of a conviction, carries penalties anywhere from two to 20 years in prison. Led by Dunn, Golden State Warriors lottery pick Ekpe Udoh, and Tweety Carter (now of the Oklahoma City Thunder), Baylor was one of the most exciting teams to watch in all of college basketball last season. Dunn led his squad in scoring, averaging 19.6 PPG and 4.2 RPG, and was fourth in the Big 12 in free throw percentage, hitting 85.7% of his attempts. Baylor made it to the Elite Eight of the NCAA Tournament last season but lost 78-71 to eventual champion Duke in a game many experts had Baylor winning, since it was played in Houston. Dunn was named to the Wooden Award Preseason Top 50 list yesterday for 2010-11 and has been named on several pre-season all-America teams. The legal ramifications of all this and the length of his suspension from the team further necessitate that five-star freshman Perry Jones hits the ground ready to be the main man right from the start for the Bears. Michigan State’s victory on Sunday is not without controversy. Tennessee’s J.P. Prince, who committed the crucial foul with less than two seconds left, went over to the scorer’s table after the game and said that he did not believe there was a foul. Although this is Tom Izzo’s sixth trip to the Final Four in twelve years, he makes sure not to take it for granted. According to Izzo, reaching the Final Four is the greatest aspect of coaching because of the work involved in getting there. The trip to the semifinals is even more impressive considering former MSU star Magic Johnson did not even believe that this was a Final Four team a month ago. Perhaps the reason for Izzo’s success is his perfectionist attitude. During one point in the game on Sunday, Draymond Green asked if he could make a mistake, and Izzo told him not at this crucial time of year. Kalin Lucas is still the hero for Michigan State, as fans chanted his name and players carried him up to the rim to cut the nets. The Washington Post looks at the brotherhood of the Duke Blue Devils in this article. Coach K has a team back in the Final Four for the first time since 2004. Was Scott Drew’s coaching inexperience exposed in the Elite Eight matchup Sunday? Here is a look at how Drew may have cost Baylor the game and a shot at the Final Four. Over the next two days, RTC will break down the regional final games using our best analytical efforts to understand these teams, the matchups and their individual strengths and weaknesses. Our hope is that you’ll let us know in the comments where you agree, disagree or otherwise think we’ve lost our collective minds. Here are Sunday afternoon’s games from the Midwest and South Regionals. Last we heard, no Spartans were injured in the last 24 hours. Tom Izzo probably can’t believe it. It’s hard to recall a team that’s had more injuries to deal with late in the season than this Michigan State squad. Still, here they are, playing for another shot at the Final Four. To get there, they’ll have to knock off a Tennessee team that certainly chose the right time to peak. The Volunteers flexed a little defensive muscle against Ohio State in their last game, taking the route of letting Evan Turner get his while stopping the rest of the starters. It worked. Turner posted 31, but the other four starters could only muster 29, and that’s why the Buckeyes aren’t suiting up on Sunday. On a normal day, we’d say that Michigan State poses a much different problem, since (sort of like the Vols) they have a variety of weapons that can rise up and do a number on you at any time. But is that the case this time? We hate to keep bringing up the injuries to Raymar Morgan, Delvon Roe, and Chris Allen, but in a game like the one they have upcoming, it matters. Tennessee loves a physical game, and Michigan State doesn’t exactly shy away from them. Michigan State — similar to their Big Ten counterparts in the Buckeyes — is a team on which six players play the HUGE majority of the minutes, though, and the big question going into the game against Northern Iowa was whether or not MSU could stand any physicality the Panthers were going to throw at them because of their MASH-unit status. To be honest, the Spartans got less than they expected, had little problem, and were thankful. The problem for MSU is that Tennessee is not Northern Iowa. The Vols have several players, all healthy, who will relish the chance to get in and bang with the MSU boys. The Spartans will try to keep this more of a half-court, keep-it-in-the 40s slog, but with so many players coming off that UT bench, will it be possible? The Skinny: One of the tougher games to project in this tournament. It runs contrary to everything within us to pick against Tom Izzo when he’s got a chance at the Final Four, but if those MSU injuries really are still there — and you don’t go from MASH unit (Izzo’s words) to healed-up overnight — then we have to figure that, with a similar talent level, a healthy 8-10 players on team that’s peaking will beat a mostly unhealthy 6-8 players who’ll probably be forced out of their usual style. We’ll go with Bruce Pearl’s Volunteers to make it to the program’s first Final Four in what should be a phenomenal matchup. After all the buzz about how great Kansas, Kentucky, and Syracuse were this season we only have one #1 seed standing: Duke. Now that we have reached this point almost everybody is picking against the Blue Devils again and they might have good reason to feel that way. All year long we have been talked about how much better the Blue Devils are on the interior compared to prior years, but their interior players will be put to the test against Baylor’s frontline of Ekpe Udoh, Quincy Acy and Josh Lomers, the best remaining group in the NCAA Tournament. While that group won’t destroy Duke’s interior trio of Brian Zoubek and Miles and Mason Plumlee because the Bears don’t rely on their big men for offense, don’t expect the Blue Devils to continue to dominate the paint like they have for much of the last two weeks. If Coach K is going to get his first trip to the Final Four in six years, he is going to have to rely on Jon Scheyer, Kyle Singler and Nolan Smith to hit shots from the perimeter against Baylor’s 2-3 zone. They will have to at least match the 40% they shot as a team from beyond the arc in their Sweet 16 win agianst Purdue. The big question mark for Duke is whether Scheyer will return to his early-season form or if he will continue his current tailspin which appears to have hit a nadir with his 6-26 shooting from the field in his last two games. 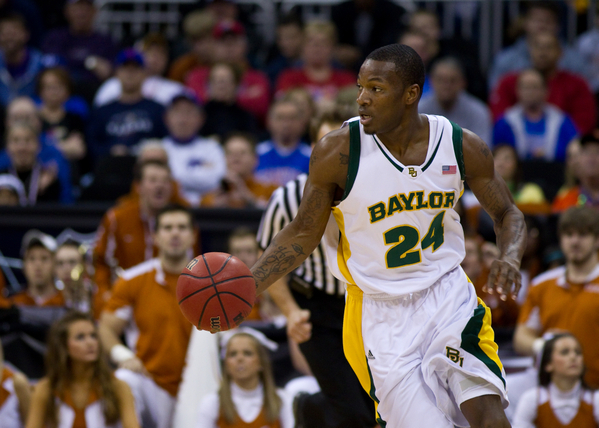 On the other end of the court, Smith and Scheyer will struggle to defend Baylor’s guards — Tweety Carter and LaceDarius Dunn — who were sensational in the Bears’ blitzing of Saint Mary’s in the Sweet 16. Smith might have a chance of neutralizing Carter, but Dunn should run Scheyer ragged unless Coach K gets him some help. The one advantage Duke has is Singler who doesn’t seem to have a peer match-up on the Bear roster. Singler will need to have a dominant game (something along the lines of 20 points and 10 rebounds) to give Duke a chance to win, but given the way he has been playing lately (like a 1st team All-American) the Blue Devils will be in it late. Then the question becomes who can convert down the stretch: Duke as the team with the pedigree and experience but a series of Tournament let downs, or Baylor as the team with the crowd behind them and a superior set of guards, but limited experience in high-level games? The Skinny: It’s tempting to go with Blue Devils and Singler here if for no other reason than you have to believe that Coach K is bound to get a team back there at some point in the near future, but today isn’t the day. The combination of perimeter play with Carter and Dunn, interior play anchored by Udoh, and the home crowd should be enough to propel the Bears to their first Final Four since it was an eight-team tournament. Blah Night of Games. So given the way this Tournament has gone through the first three rounds, we should be heading into two classics on Saturday evening in the West following by the East Regional finals. On consecutive Thursdays we had an incredible set of games followed by a rather pedestrian Friday set. Last Saturday was another blockbuster, while Sunday was relatively tame. Don’t let us down, K-State, Butler, Kentucky and West Virginia. Tennessee 76, Ohio State 73. On Selection Sunday, every pundit talked about how great the teams were at the top of the Midwest Region, but they may have forgotten the Volunteers who were grossly underseeded. Now they are showing the Selection Committee and the rest of the nation just how good they are. In a rematch of a 2007 Sweet 16 game that ended with Greg Oden blocking a shot by Ramar Smith that could have won the game for UT, the Volunteers got their revenge in a similar fashion. This time it was Tennessee’s J.P Prince who saved the day, blocking a desperation off-balance three by NPOY Evan Turner that could have tied the game at the buzzer. While this game wasn’t quite as spectacular as the Kansas State-Butler game last night, it certainly lived up to the expectations we would have of a Sweet 16 game as neither team was able to open up more than a seven-point lead and for most of the last 35 minutes of the game it was a one-possession difference. Thanks to a strong performance by Wayne Chism who had 22 points (18 in the second half) and 11 rebounds the Volunteers were able to overcome another phenomenal performance by Turner who finished with 31 points, 7 rebounds and 5 assists. Unfortunately for Turner, Thad Matta was unable to coax similar performances out of any of Turner’s teammates who were 3-16 from the field during the second half when Turner scored 21 of his 31 points. Perhaps it was the ridiculous minutes that Matta made his rotation play recently, but the Buckeyes just didn’t see to have the necessary spark. Without the necessary support, Turner was forced to try win the game in the final minutes when David Lighty hit consecutive baskets to give OSU a 70-68 lead. After Chism responded with four straight to give the Vols a 72-70 lead, Turner hit a three that put OSU up one and had everybody believing that maybe, just maybe, he could be enough to carry his team to Indianapolis. Those hopes were dashed when Brian Williams converted a tip-in with 32 seconds to go and Turner was unable to make a driving layup with the ensuing loose ball ending up in Tennessee’s hands. After Tennessee converted a pair of free throws, the stage was set for Turner to etch his name into Tournament lore, but after missing a good look with a little over five seconds left he chased down the ball only to have an off-balance shot blocked by Prince. Despite the disappointing finish, this year will go down as Turner’s year in the minds of everyone who watched him this season. Although Turner says he isn’t sure what he will do with regards to the NBA Draft, we suspect that he will be headed toward NBA millions very soon. Next up for the Volunteers (playing in their first Elite Eight in school history) will be Tom Izzo’s Michigan State Spartans. With the Vols on the verge of a Final Four trip less than three months after their season fell apart on New Year’s Day during the Tyler Smith fiasco, we have to ask the question that we asked almost a month ago: How is Bruce Pearl not mentioned as a legitimate National Coach of the Year candidate? Nobody has overcome more adversity than the Vol coach and yet he didn’t even finish in the top two in his own conference voting (behind Kevin Stallings and John Calipari). Izzo Does It Again. #5 Michigan State 59, #9 Northern Iowa 52. It’s starting to feel like Tom Izzo could take a group of circus animals, screw around with them for a few months and then have them all come together just in time to make a run to the Final Four. With tonight’s win over Cinderella and Kansas-slayer Northern Iowa, Izzo’s team will return to the Elite Eight for the seventh time in his fifteen years at the schools (he’s 5-1 in this round). It’s especially amazing considering just how banged up his Spartans are and how inconsistent they’ve been throughout this season. But MSU did what they do, which is play inspired defense, make just enough plays on offense to put together a mini-run and squeeze the life out of the game in the final minutes to seal the victory. Northern Iowa is just another victim on a long, long list of teams that have fallen as a result of this strategy. As usual, the Spartans shut down the key players for UNI, with last weekend’s hero shooting a rough 2-9 from the field and contributing only nine points, Adam Koch struggling to get the ball in the right places and adding only 13 in 18 foul-plagued minutes, and Jordan Eglseder coming up with only nine himself. The Panthers shot only 39% from the field, which is on par with what they were able to hit against Kansas last weekend, but they were unable to force as many turnovers against MSU and they were absolutely ice cold during the last quarter of the game (zero FGs in the last ten minutes of action). Northern Iowa was undoubtedly one of the best stories of this year’s Tournament, and they have nothing to be ashamed of in losing a defensive grinder with the team that wrote the template. Any of a number of other surviving teams in the Elite Eight could have been challenged by the Panther defense and style of play, but it was quite simply a bad matchup for them. Even a battered and beat up Michigan State team isn’t going to allow another team to out-Izzo them, which is what would have had to happen for UNI to win this game tonight. Over the next two days, RTC will break down the regional semifinal games using our best analytical efforts to understand these teams, the matchups and their individual strengths and weaknesses. Our hope is that you’ll let us know in the comments where you agree, disagree or otherwise think we’ve lost our collective minds. Here are Thursday night’s games from the East and West Regionals. We know the Buckeyes have had three full days of rest since their second round game against Georgia Tech. But Thad Matta has shortened (and by “shortened,” we mean “set on fire and forgotten about”) his bench so much late in the season and in this tournament that you have to even wonder if that’s enough time for the Buckeyes to recover. Jon Diebler has played every minute of the Buckeyes’ first two tournament games. William Buford has missed two minutes of action TOTAL out of the possible 210 minutes of game time in the Big Ten and NCAA tournaments. David Lighty and Evan Turner have only sat for five minutes in that same time span. The only starter who sits for any amount of time is big man Dallas Lauderdale, and he still plays at least 30 minutes a game. Yet, the Buckeyes keep rolling. The only thing Jon Diebler seems tired of is finding himself open behind the three point line. He’s 11-22 in OSU’s two tournament games, and a lot of these things aren’t monitor-checkers. They were deep. And of course Turner has shown us his usual excellence. There aren’t any surprises with the Buckeyes. Tennessee, though, is a different story. You never know whose night it’s going to be. Scotty Hopson, Wayne Chism, J.P. Prince…any one or two of these guys can get hot, but then you have to worry about players like Brian Williams or Melvin Goins or Bobby Maze stepping up with a 15 point or 12 rebound night. OSU’s four-forwards-and-Turner (who’s officially listed as a forward!) will be able to keep the Volunteer guards from getting too out of hand, but can they guard and rebound against the slightly taller Tennessee bigs? As a team, rebounding is one of the few Buckeye weaknesses, and Tennessee has shown the capability to dominate the glass this year when they put their minds to it. Both teams are among the nation’s best when it comes to guarding the three, but it’s OSU that gets a little more of their offense from the long ball. On paper, the matchups are not favorable for OSU. And the Tennessee kids are the kind who will relish the fact that they’re “supposed” to lose this game. We doubt it’ll be a blowout, and remarkably both of these teams are fantastic in games decided by ten points or less. In those games, OSU is 10-5 this season, and Tennessee is 13-2. It’s gonna be a fun one. The Skinny: If both teams guard the three well, it will hurt OSU more than Tennessee. Factor in the possibility that all those minutes could be catching up to the Buckeyes, and you have the makings of an upset. It’s not easy taking the Volunteers in this game, because of how they can sometimes take nights off between the ears. But Tennessee has had two chances to underestimate their opponent in this tournament, and didn’t either time. They won’t here; they know what OSU can do. Wouldn’t be surprised to see the Volunteers emerge. 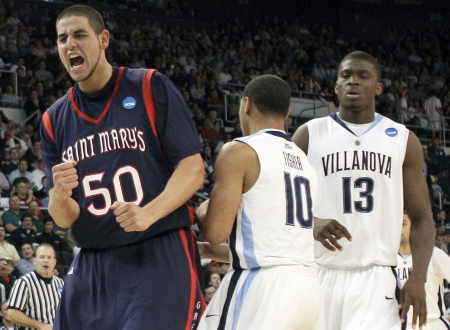 The Gaels come into this game as one of the tournament’s Cinderellas, but this time Cinderella is actually the Tournament’s giant with Omar Samhan who has been the most dominant big man in the field so far after dominating Richmond and Villanova to the point where analysts were ripping Jay Wright for not doubling down on Samhan fo abusing Villanova’s interior players. In Wright’s defense, doubling down on Samhan would leave the St Mary’s guards open on the perimeter where they rank fourth in the country from beyond the arc. Scott Drew probably won’t be saddled with that dilemma since he has a center in 6’10 Ekpe Udoh who is every bit as good as Samhan. Even if Samhan does get the edge on Udoh here he will have to deal with 6’10 Anthony Jones, 7′ Josh Lomers and 6’7 Quincy Acy. With such a strong interior defense, the Bears block more shots than any other team in the NCAA Tournament at more than seven blocks per game so don’t expect Samhan to dominate the Bears like he did the Spiders and Wildcats. In addition to the challenge for Samhan on the offensive end, he will also be under pressure on defense going against a likely first rounder in Udoh. After hearing that you might be forgiven for thinking that this game will be decided solely on what happens on the inside, but you would be wrong. The matchup of guards featuring LaceDarius Dunn and Tweety Carter against Mickey McConnell and Matthew Dellavedova could be the key to the game with the Bears having the edge in athleticism and the Gaels having the edge in shooting. Saint Mary’s will need their perimeter players (especially McConnell who is a ridiculous 75-145, or 51.7% from 3 this season) to hit treys against Baylor’s zone to open up space for Samhan to operate. If McConnell and Delledova can keep Dunn and Carter in front of them most of the time, the WCC might get its first team in the Elite Eight since 1999 when Gonzaga made it their before losing to eventual champion UConn (yes, that is the last time the Bulldogs made it that far). The Skinny: Everyone will be talking about Baylor coming into this game with the homecourt advantage since the game is being played in Houston (a little over 180 miles away from Baylor’s campus in Waco), but Baylor doesn’t have a strong following like other schools in the state do. In fact, we might get a “Duke at Greensboro” situation where UNC fans (or in this case Texas and Texas A&M) root against the local team. Still the combination of Udoh, Dunn, and Carter should be enough to get it done as Samhan’s beastly NCAA Tournament run comes to an end. Michael Vernetti is the RTC correspondent for the West Coast Conference. Most tournament previews concentrate on team performance in the Big Dance leading up to the showdown at hand. With Saint Mary’s you have to back up a little bit, as getting there was almost as big to them as how they have played in the first two rounds. The Gaels made it as difficult on themselves as possible by going into the West Coast Conference championship game in Las Vegas on March 8 needing a win over Gonzaga to ensure an NCAA bid. Failing on that same stage the year before, Saint Mary’s watched in stunned silence as the selection committee deemed it unworthy of an at-large bid. No way were the Gaels going to trust their fate again to a bunch of strangers. By not only defeating Gonzaga but hammering the Zags 81-62 in a game where even the walk-ons got off the bench, Saint Mary’s kicked a giant monkey off its back. Its play last weekend in Providence can be seen as a continuation of the resurgence witnessed March 8 in Las Vegas: confidence borne of defeating its most stubborn conference nemesis led the Gaels to play with authority against both Richmond and Villanova, both of which were favored. The Gaels have been on a roll since Las Vegas, and the Sweet Sixteen in Houston is just the third stop on a journey they feel will not end before Indianapolis. Over the next two days in a series of separate posts, RTC will break down all 16 of the second round games using our best analytical efforts to understand these teams, the matchups and their individual strengths and weaknesses. Our hope is that you’ll let us know in the comments where you agree, disagree or otherwise think we’ve lost our collective minds. Here are the Saturday games. A great opening game of the day for the group of teams that produced the best opening day of the NCAA Tournament ever. A lot of experts are going to be calling for an upset here and based on the way these two teams are playing we can’t say that we blame them. The Wildcats came into the NCAA Tournament having lost five of seven games and nearly lost to Robert Morris (down by 7 with less than 4 minutes left before some controversial calls went ‘Nova’s way). On the other side, the Gaels stormed through the West Coast Conference Tournament and knocked off Richmond, a team that a lot of people had as a potential sleeper, in the first round. The key to this game will be how Reggie Redding handles Omar Samhan. After watching Samhan rip apart the Spiders, Jay Wright has to be concerned about his interior players going against one of the best low-post players in the country. On the other side, Saint Mary’s has to figure out how to deal with Scottie Reynolds and the rest of the Wildcat backcourt. They are certainly better equipped to match-up with Villanova’s perimeter players with Mickey McConnell and Matthew Dellavedova than the Wildcats are to handle Samhan. Saint Mary’s perimeter players pack enough offensive punch to make keep up with Villanova’s guards, but Mouphtaou Yarou and Redding shouldn’t challenge Samhan too much defensively. The one wildcard here is Reynolds. Will he “learn” from Wright’s “teaching moment” and become the Scottie Reynolds we knew for most of the past two seasons or will be the 2-15 from the field Reynolds? The Skinny: Samhan overwhelms the Wildcats on the inside and advance into the Sweet 16 as this year’s Cinderella. The second game of the second round will feature the top mid-major program in the east versus an upstart who would love to get there themselves. In their first round game, if you haven’t heard, the Racers’ Danero Thomas hit a shot at the buzzer to knock Vanderbilt out of the Tournament, but what you may not know about that game is that Murray State pretty much controlled it throughout. It was very late when Vandy regained the lead and set the stage for Thomas’ game winner. The point: Murray is better than your typical #13 seed Cinderella. Butler, on the other hand, had a weak first half and a superb second half to put away UTEP. It was two of the staples of Butler’s attack — relentless halfcourt defense and the three-ball — that allowed the Bulldogs to quickly take the lead and never look back against the Miners. As for this game, Murray State does many of the same things that Butler does, it’s just that Brad Stevens’ team does those things better. It will certainly be interesting to see how Butler responds to being the Big (Bull)Dog in an NCAA Tournament game, as they’re usually the upstart taking on some higher-seeded Kansas or Florida type of team. The Skinny: We’d love to take Murray State here, but Butler isn’t going to let a johnny-come-lately out-Butler them en route to the Sweet Sixteen, so we expect Butler to hang on and win by 6-8 points. Each day this week during the first two rounds of the NCAA Tournament we’re asking some of our top correspondents to put together a collection of notes and interesting tidbits about each region. If you know of something that we should include in tomorrow’s submission, hit us up at rushthecourt@yahoo.com. The first “upset” of the tournament occurred in the South Region when SWAC champion Arkansas Pine-Bluff took down the Big South tournament champion Winthrop, 61-44. The Golden Lions earned the right to play top seeded Duke on Friday night. When #9 Louisville takes on #8 California on Friday night, Louisville head coach Rick Pitino says he’ll be ready for the Bears’ “organized chaos.” There is also an interesting quote in the article from Cardinals’ guard Edgar Sosa that says he has heard Cal referred to as “poor man’s Marquette”. Utah State’s leading scorer, junior guard Tai Wesley, broke his nose in the WAC tournament final on Saturday when the Aggies got pounded by New Mexico State. He will play in the Aggies’ upcoming game versus Texas A&M, but you have to wonder what kind of effect it will have on USU’s star. On TAMU’s side, they will have Dash Harris back in the lineup after he missed the Big 12 Tournament with a bone bruise in his right wrist. Head coach Mark Turgeon said that if his team wants any chance to win this weekend, they will need Harris healthy. Fran McCaffery is not letting his Siena team think they can beat Purdue by just showing up in Spokane on Friday. He says Purdue is by far the best team Siena will face all season even without Robbie Hummel. You’d have to think a Butler Bulldogs fan would think otherwise. Here is an interesting article from The Times-Picayune which highlights the #3 Baylor vs. #14 Sam Houston State game. Not only are the two teams from Texas, but they have two New Orleans natives returning to their home town for the first round. Star senior guards Tweety Carter (Baylor) and Ashton Mitchell (Sam Houston State) both played their high school ball in The Big Easy. Over the next two days in a series of separate posts, RTC will break down all 32 of the first round games using our best analytical efforts to understand these teams, the matchups and their individual strengths and weaknesses. Our hope is that you’ll let us know in the comments where you agree, disagree or otherwise think we’ve lost our collective minds. Here are the Thursday afternoon games. The NCAA Tournament kicks off in style this year with a good first round game from Oklahoma City. BYU enters the postseason riding the wave of one of its most successful regular seasons in decades, but it won’t matter much if the Cougars can’t slay their old bugaboo of winning a first round game on Thursday afternoon. The last time BYU won an NCAA opener in 1993, Grant Hill’s high fade was in style and the internet was something employees wore in their hair at fast food joints. Eight trips later, BYU has by far its best team and chance to end that losing streak. Jimmer Fredette is the best player casual fans haven’t yet heard of, but his 21/3/5 assts per game and 45% three-point shooting allow for the occasional explosion, as in the cases where he dropped 49 points at Arizona or 45 against TCU just last week in the Mountain West Tournament. The Cougs’ opponent, Florida, limped into the postseason, having lost four of five games and is a questionable entrant (especially as a #10 seed). But the Gators are still dangerous, boasting five players who average double figures with an ability to go off at any time. The most difficult problem Florida will face, though, is how to stop the highly efficient offense that BYU brings to the dusty plains. Dave Rose’s team shoots well from everywhere on the floor, and the Gator defense has been appropriately described as soft throughout the season, so UF will have to get into a high-scoring shootout to have a chance to outscore the Cougars in this one. The Skinny: it’ll be difficult for Florida’s defense to slow the offensive talents of Fredette and his Cougars so we’re going with BYU by ten in a shootout. Everybody knows about the Irish and their response to what was believed to be a potential season-ending injury to their superstar Luke Harangody. After the injury (and during Harangody’s return), the Irish have rebuilt themselves into a better team. We’re not saying they are a better team without Harangody because that would be ridiculous, but the brand of basketball they play when they don’t dump it down to him and watch him go to work is producing better results. They will have their hands full with the CAA champion (both regular season and tournament) Old Dominion. While the Monarchs ended up losing many of the “resume-building” games they played this year, they were competitive in most of them (5-point loss versus Missouri and 9-point loss at Northern Iowa) they also managed to win the biggest game on their schedule at #3-seeded Georgetown. So we know they can hang with a Big East team. Now the question is whether senior Gerald Lee can put it together to lead Blaine Taylor’s squad to an upset in the first game of the NCAA Tournament. It says here that they can, but the Irish are playing so well that they won’t. The Skinny: Notre Dame gets enough production from each of its key scorers and is able to clamp down late on Lee and company to eke out a six-point victory.